← Star Child turns 16! The Handy Man has been busy the past few weeks trying to finish the kids’ bathroom before he goes off on Wednesday for a mini-mission trip in the big city near us. The Handy Man has been involved with GAP for thirty-two years now. All our children have been involved since birth, and once they reach the age of 12, each one is allowed to go to GAP with Daddy. But that means that my helpers all leave…and the bathroom is not quite finished yet! Star Child asked her Daddy if he could please fix the bathroom so there was a working tub in it before her birthday party, and he decided it was time. He loves any excuse to go to Lowes made a trip to the local supply store with the trailer to get a tub. The next step was to get the tub into the house via the sliding glass door in our laundry room. He had to cut a new door into the laundry room as the old door was in the wall where the new vanity will eventually go. 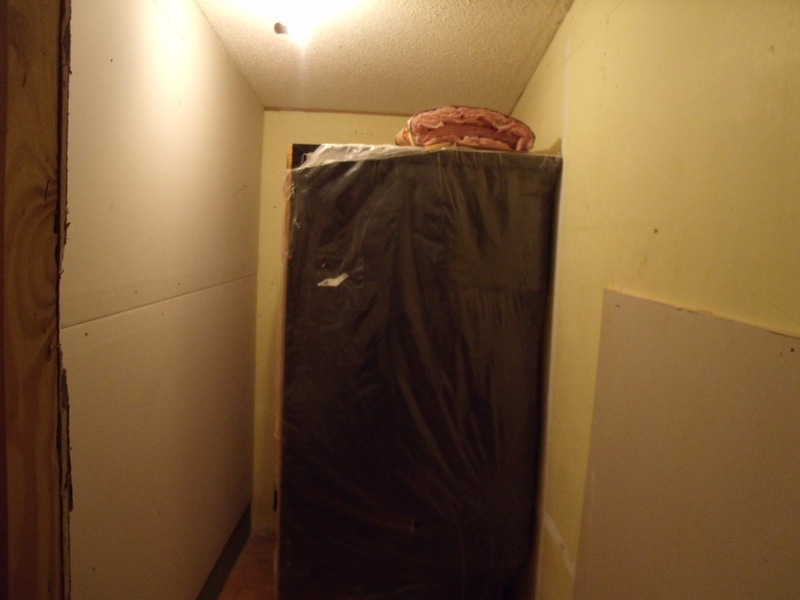 He then built a new wall, cutting the laundry/storeroom in half, and expanding the bathroom to twice its former size. The new tub between the old wall (on the right) and the new wall (on the left) as viewed from the old laundry room doorway. 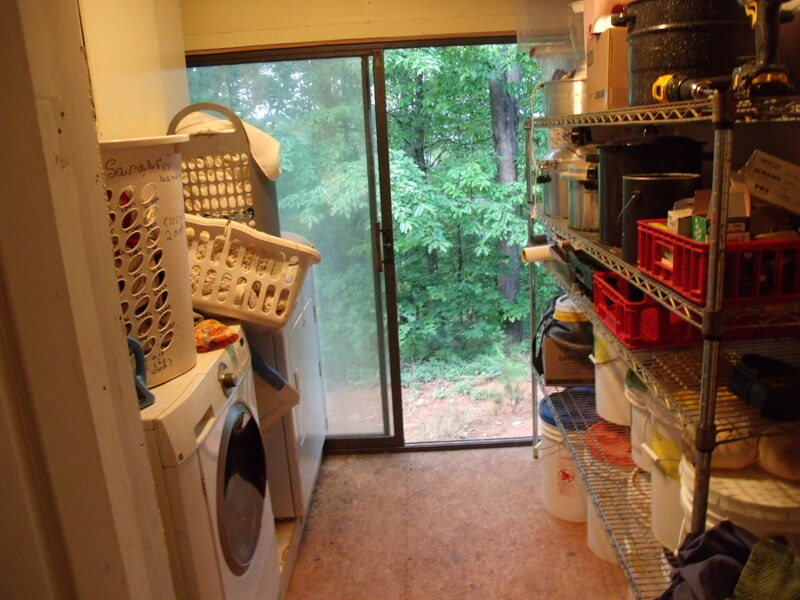 My laundry room in all its glory–and half its former size. Notice that we have to be creative in our storage…that on that right is my shelf with our bulk grains underneath. Ignore the laundry baskets on the left…that is, sadly, a true representation of the laundry situation on a good day. And, yes, we DO need flooring in this room. Our old bathroom before the remodeling began in earnest. The tub was where the walls are all ripped out…the cat is purely for decoration as she is totally useless as a tub….the sink is closer to where I am in the doorway and to the left. This bathroom was about 4.5′ x 9′ before we began the remodel. 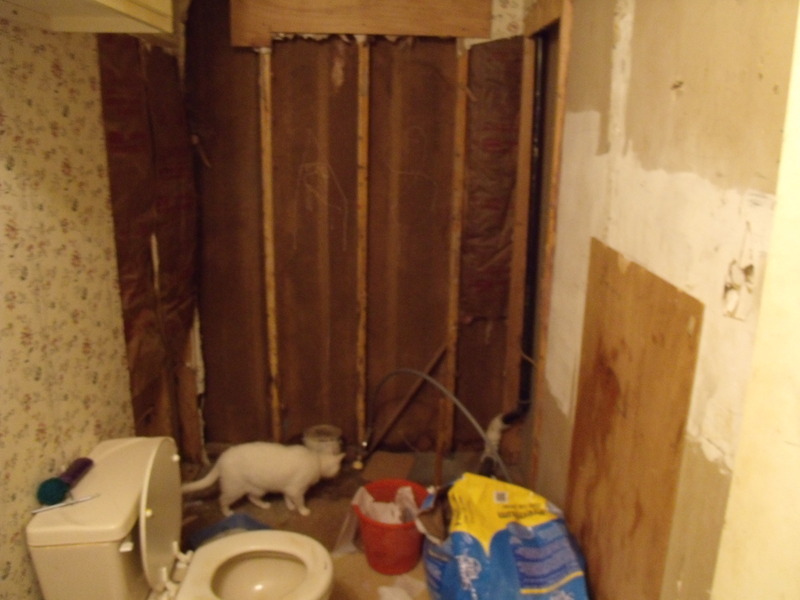 He tore out half the old wall–the other half is still up as that is where the old sink is. He installed the new toilet and took out the old one, which necessitated his putting in new pipes under the house, re-routing water supply lines and taking out the old plumbing so we could cover the floor. (Before the new toilet went it, he installed the sheet rock behind it and I painted it a khaki color. I have to claim something in this project!) He installed the new bathtub. And that was all done in time for Star Child’s party. This is what happened when the Handy Man took the old shower head piping out…Curious George LOVES a bath, even when the pipes aren’t connected to actual water. His clothes were scatted over the porch…. Here is a view from the old tub location looking at the old sink (which is still in place) and into the new part of the bathroom where the wall has been torn down. You can see the new tub in the corner back there….and where I had the paint out. A working potty in its new location! Hey–doesn’t that wall behind it look just amazing?!? 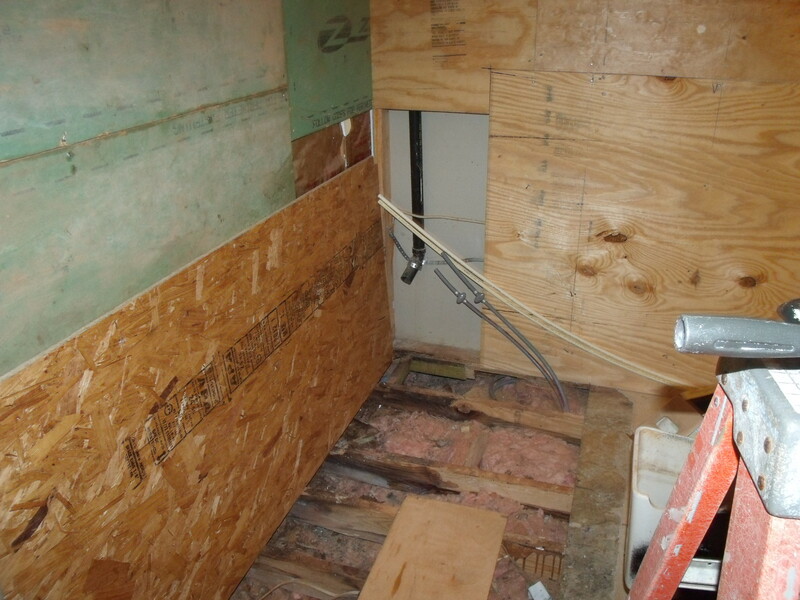 Standing in the new part of the bathroom, looking toward where the floor has been ripped out in the old tub section. The Handy Man was prepping for the new water supply to the toilet and the shower. 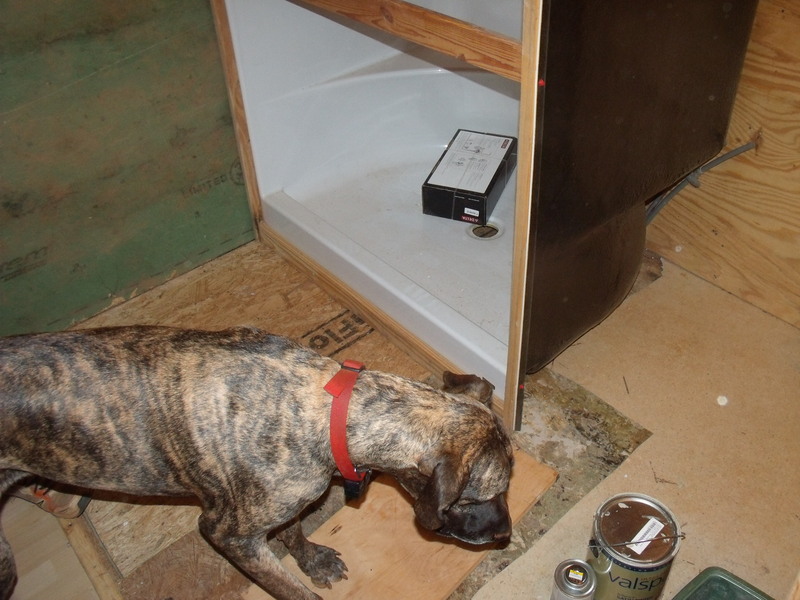 One of the girls was on the ladder documenting this part…Mischief our great dane had to inspect the new plumbing. You can see the new shower in place over the replaced floor. It is ready to be plumbed at this point as all the under-floor pipes were in place. That board where Mischief’s front paws are resting is covering the hole where the old toilet sat. 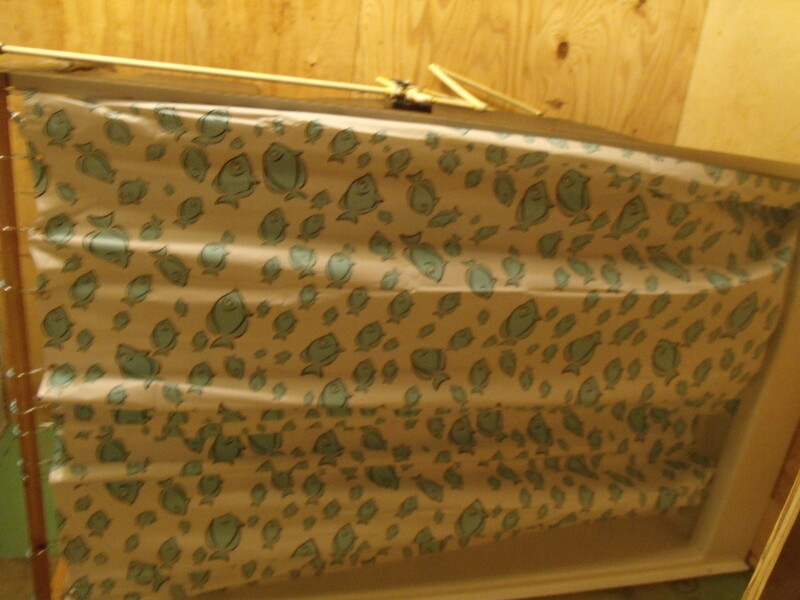 While we partied for Star Child’s 16th birthday, the Handy Man set the tub temporarily…he even bought a cute shower curtain for it. It may not be pretty, but it is functional! The Handy Man puts down new flooring after putting in the outline of the new walls. You can see where the division is between the toilet and bathtub area, and you can see where each will have a door. The sink and mirror here will eventually come out. 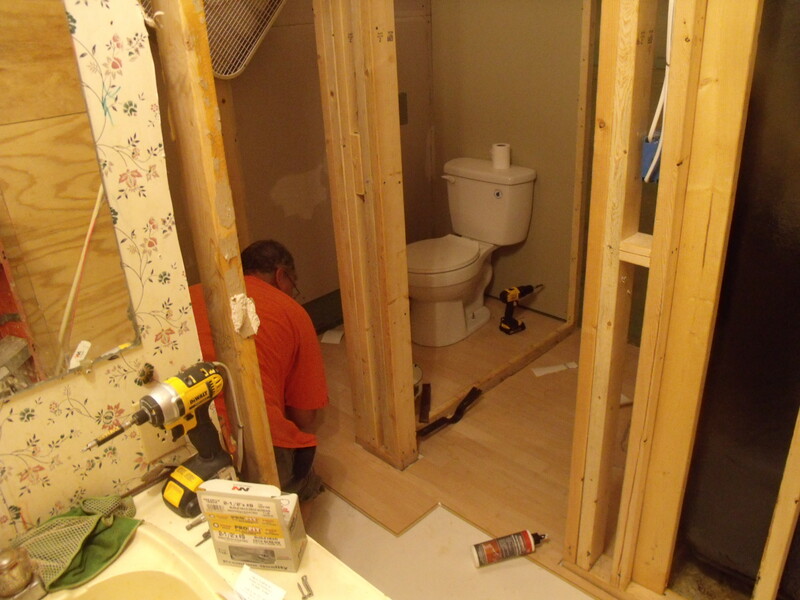 Next, he began working on the walls to separate the toilet and the bathtub areas. He had to run wire and install a light and fan assembly in the toilet area and bathtub area. When the bathroom is finished, we will have two privacy areas with doors and then the common sink area. The idea is to accommodate as many bathroom users as possible at one time. I am not sure if other families deal with children who manage to put holes in walls the way we do. 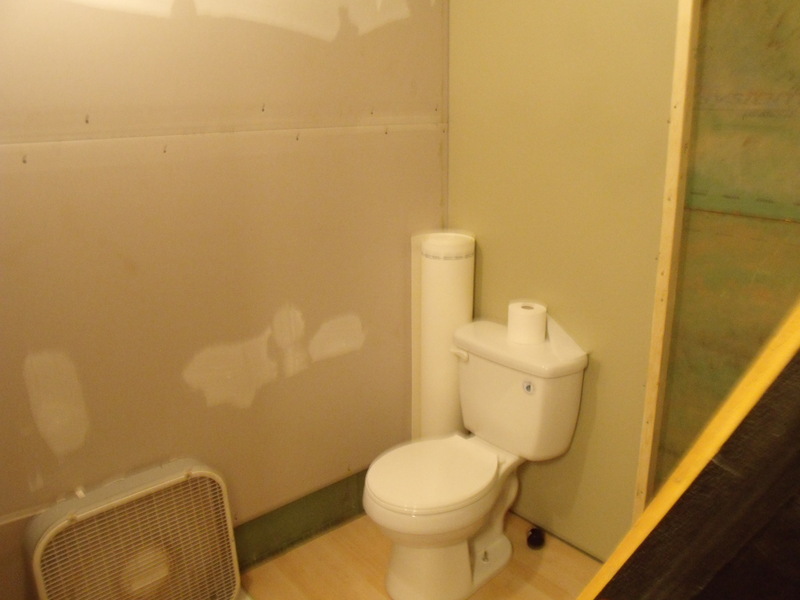 It annoys the Handy Man greatly when someone manages to damage a wall, so he vowed two things in this bathroom remodel: he is teaching the girls how to mud the walls themselves, and he is making the bathroom walls indestructible. 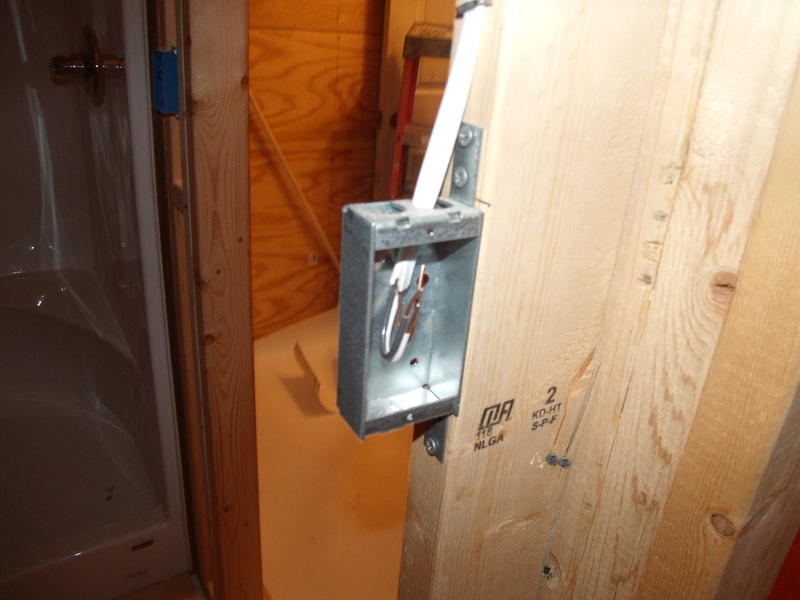 What that means is that he used metal studs to form the main wall, and he is lining the walls with plywood. The drywall is being installed over the plywood. Not only will the walls be indestructible, but we will also be able to attach the multiple towel racks and shelves (one for each child) without having to look for studs. It costs more, but I think in the long run it will be a good thing. During this time of remodeling, I have been reminded of a spiritual parallel. Just as the Handy Man had to tear out entire sections of our bathroom in order to change the infrastructure underneath, sometimes the Lord has to tear out huge sections of our hearts in order to change the structure inside. The Handy Man removed rot, put in good pipes, and put down a good sub-floor. Likewise, I have found it to be true that the Lord has had to take out the rotten parts of my heart in order to heal the brokenness and hurt there. It was painful at times. And the process isn’t very beautiful. Our bathroom looked pretty bad during the time that the Handy Man was tearing out components. Our bathroom is still not finished…and neither am I. 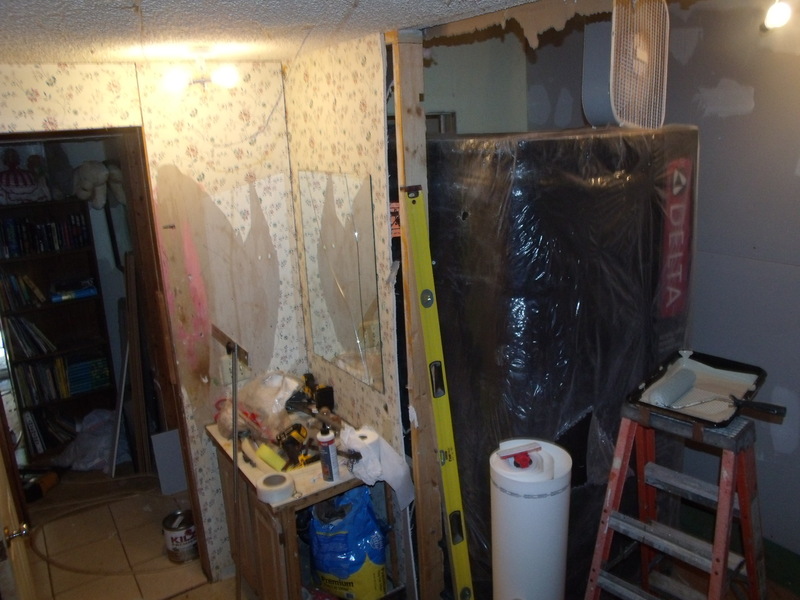 The sink will eventually be moved, which will necessitate taking down the rest of a wall, installing new pipes and constructing a new sink structure. He will have to put up a new wall and run wires for the new light. In other words, before the bathroom can be whole, it must be broken. And before any of us can be whole, we must be broken. I used to think that somehow when people came to know Jesus, all their troubles went away. In fact, there are some out there that preach a gospel of prosperity and promise that life will be magically easier and better if you just “give your heart to Jesus.” The problem with this so-called “gospel” is that it is not true. Jesus did not promise us prosperity or freedom from pain and problems. What he promised was that he would never leave nor forsake us; that the work He began in us, He would see through completion; that if we follow Him, we must first deny ourselves and take up our cross. He also promised us that His sacrifice on the cross was so complete that it satisfied the righteous demands of the Law–He lived perfectly because we couldn’t to pay the penalty we deserve (but could never pay) and He rose again after dying in our place in order to secure for us a future with Him…all when our sins had separated us from our Heavenly Father. We are promised that we get to share in his sufferings. There isn’t much prosperity in suffering. It looks rather messy at times–like a room torn down to its studs with giant holes in the floor and exposed pipes. Until we see ourselves as sinful–as poor, and needy, and unable to be the perfection that is required–we are lost. We are as useful for the kingdom as a toilet that sits in the floor with no pipes or water connected to it, or a shower head attached to pipes that aren’t to anything. In order to be in working order as Christians, we must acknowledge our sins and cling to the only One who can atone for our sins and forgive our sins. The cool thing about our bathroom under construction is that, while it may not look good right now, it is functional. And that is something to which I can relate. My life has been a mess during times of reconstruction, and it has been very painful at times. As God has rerouted some pipes and torn down walls and helped me erect better boundaries (like our bathroom partitions) in my relationships, I have grown stronger and I have healed. It hasn’t always been a pretty sight, and like the sweat drops that have rolled off the Handy Man’s brow, the tear drops have fallen from my face at times. The Handy Man has had some help in his endeavors from our daughters. They have carried sheet rock, helped to hang sheet rock and put mud over the screws. They have crawled under the house with him to move pipes and close off holes where pipes once went. They have carried out the remains of the old wall and flooring. They have shared in the labor and gotten dirty with the Handy Man. I have had help in my remodeling, too. I have dear friends who have labored with me, listened to me, pointed me back the truth of God’s Word time and again. I have friends who have carried my burden, prayed for me and my family, and loved me when my attitudes and words were not very admirable or loving. I am so fortunate to have friends who have gotten dirty with me. But there is One who has ultimately carried all the filth that I had on me away. His name is Jesus, and He is the one who cleanses and changes my life. He is not done yet. I am very much a work in progress–under construction, if you will. Like our bathroom, there are parts of me that are not very attractive just yet, but one day, they will be not only functional, but beautiful, too. And that is something for which I must patiently wait. Just like our finished bathroom.